Cleatis Allen Jr., also known as Jr. Mane is the new funny man of comedy. Voted “Funniest Man In Memphis" in Commercial Appeal . His natural wittiness evokes laughter in everyone from the jail house to the church house. Born in the small country town of Pisgah, Tennessee, which is close to Memphis, Cleatis knew his gift was making people laugh, even at a young age. Early on, his parents recognized his outgoing and entertaining personality and allowed him to go to the National Baptist Convention to audition for there very competitive theater program . Of the thousands of kids who were auditioning, Cleatis landed a lead role in the play each year for several years. To spice the plays up a little, Cleatis would improv on certain scenes to incorporate humor and make the crowd laugh that lead to being hired as a fulltime writer for ther theater program. Over the years, that same outgoing and entertaining personality mixed with hard work has landed him opportunities to work with some of the most notable comedians in the industry. Boasting his talents in front of sold out crowds, Cleatis has toured with King of Comedy Steve Harvey, Queen of Comedy Monique, Bruce Bruce and singer Fantasia. In 2009, Cleatis was invited to perform on the popular Tom Joyner Fantastic Voyage Cruise. There, he opened for comedians D.L. Hugley and Paul Mooney. The opportunity to be surrounded by other comedians, actors, and radio personalities inspired Cleatis to expand his company Cuzz Productions. Through Cuzz Productions, Cleatis has created opportunities for other up and coming comedians to perform and showcase their talent. 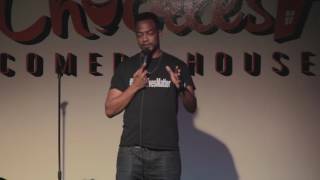 He is the host and mastermind of “Clean Comedy ,” an annual event since 2006, and “Trippin Sippin Saturdays,” a monthly event that happens every first Saturday in Memphis, TN. Cleatis is the Co-Producer and Co-Host for the "Cleatis and Je 'Nay morning show" an online radio program on wrugradio.com. Cleatis most recently made his way into network television on Bounce TV's hit new comedy show "Off the Chain" Season 2 in Feb 2014 and just recently landed a show with Kevin Hart on Comedy Central, Hart of the city season 2 that airs 2017. Living his dream of making people laugh, Cleatis will to continue to grow and entertain people. With plans to write plays, start his own sketch comedy, and create an internet television show, Cleatis is well on his way to becoming a well known name in comedy.